Having a toddler in the house is a sure-fire way to gauge the arrival of cold and flu season. When my little guy’s nose starts to do the leaky faucet thing, I know I’m already doomed to experience a 10-times-worse version of whatever he’s beginning to suffer from. Wouldn’t we all love to be able to better control the spread of germs in our homes? One tactic to consider, if you’re planning a kitchen or bathroom renovation, is to install a hands-free faucet. These aren’t just for the commercial market anymore. There aren’t an abundance of residential options, but there are a few I particularly liked the styling of. As an added bonus, they create a sleek look on the countertop unencumbered by handles, levers or knobs. The Moen Destiny hands-free faucet is a completely touchless design (i.e. it is motion activated). Its minimal contemporary styling, arched neck and chrome finish would be a great addition to a modern spa-like bathroom. 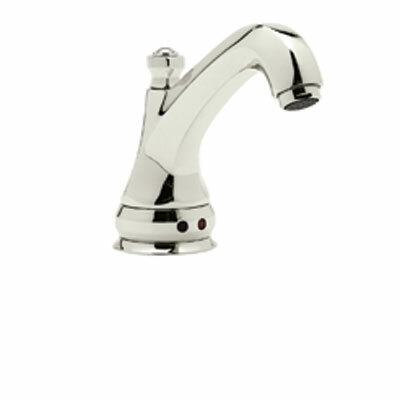 The Hex Hands Free Lavatory Faucet from Rohl’s Country collection (Country in the European, not American sense – I have the Rohl Single Lever Country Faucet in my new kitchen). This is a more traditional design, and is activated based on ‘presence’ – also touchless. 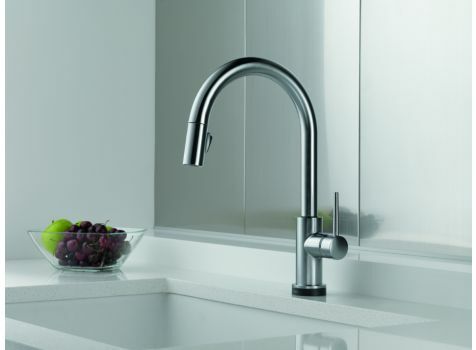 The Delta Trinsic faucet features the company’s “Touch20” technology, which allows the water to flow when you touch the spout. Of course, touching with your hands would kind of defeat the purpose – the intent is that you would nudge it with your wrist or some other cleaner area of your arm. Great for when you have two hands full of raw chicken juice and need to wash up. I like the look of the long, sculptural neck on this model to add a bit of ‘jewelry’ to your contemporary or transitional kitchen. If you’re considering a hands-free faucet, it’s important to note that they cannot completely prevent the spread of potentially harmful viruses and bacteria. Proper, regular cleaning is still necessary. Unfortunately, there’s no ‘magic bullet’ solution – but if you’re like me, an admitted hand sanitizer addict, you’ll take all the help you can get! 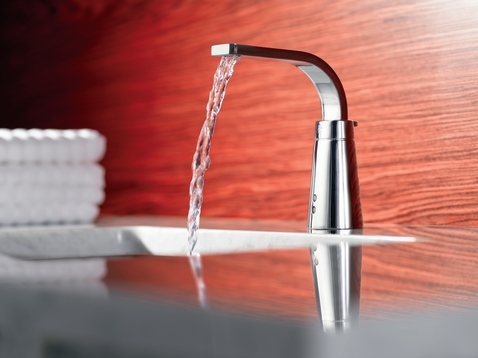 So…what do you think of touchless and/or touch-activated faucets?